« Homepage / Gourmet / "Crab Cravings: making a mess with fresh seafood"
On a remote edge of Lake Pontchartrain, Louie Lipps is boiling crabs. "I cooked for my family all my life. I’m the main guy who cooks," he says. "I just learned that people like the taste of seafood without burning your mouth off for forty minutes after you eat." 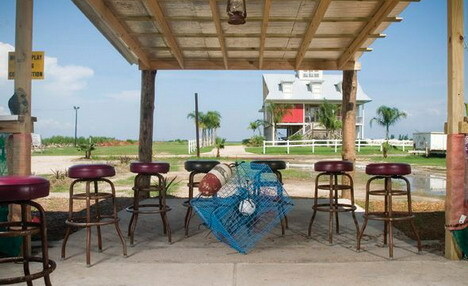 A devoted seafood lover, Lipps owns the Crab Trap restaurant in Frenier, located on legendary Peavine Road near the Peavine boat launch just outside LaPlace. "We serve Lake Pontchartrain crabs. There ain’t no better crabs in the world," he says. 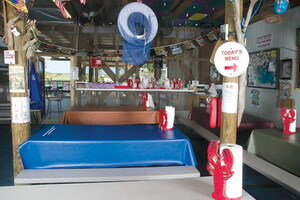 The Crab Trap opened in February. Although boiled crabs and soft-shells are popular, the big draw is the succulent barbecue crab, a novelty. "You have to be willing to get down and dirty with them," Lipps explains. "They are made in the same sauce as the barbecue shrimp," he reveals. "They are very good and very messy. I offer an apron with them. I have a couple of dozen aprons hanging up on a pole and I suggest you go and get them." The casual eatery only serves guests on weekends (11 am – 8 pm Friday, Saturday, and Sunday) but the word is out and people are starting to show up in groups to sample the famous boiled and barbecue crabs, in addition to barbecue shrimp. "You get three pieces of French bread with that," Lipps explains. Crawfish are served during the season only. 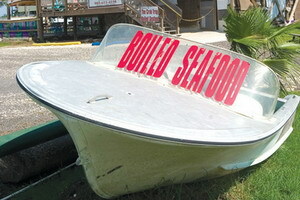 The restaurant is located on the bottom deck of a building with a screened in dining room. Big fans keep the patrons cool. Lipps’s sno-ball stand, which opened two years ago, sits above the restaurant 16 feet in the air, offering a great view of the lake. "I was getting business from Peavine Snack Shack, which is across the street, plus from the boaters," he says. "I used to sell my crabs live. I have 22 tanks." 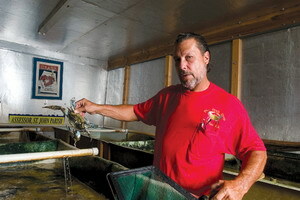 Lipps produces his own crabs for the restaurant. Across the driveway is a metal shed which is outfitted with an elaborate filtration system that connects a series of tanks containing crabs. 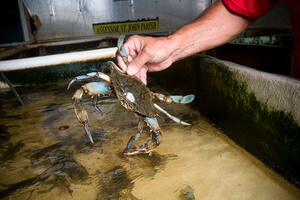 Some are hard-shell, while others are going through the molting process to become soft-shell crabs. "I used to have a camp out in Little Woods where I was catching hard-shell crabs and shedding soft-shell crabs. It used to be called the Old Mama Lou’s. It was over the water," Lipps says. "I get my crawfish for the restaurant from the Atchafalaya Basin, or I get some farm-raised crawfish from Opelousas. I purge them overnight. They are the cleanest crawfish you will ever eat." Patrons place orders at the self-serve counter and enjoy their meals on picnic tables. "We take down your name on a pad and call you when the order is ready," Lipps says. You pick up your own drinks from the cooler. Aside from fresh seafood, you can get boiled corn, potatoes, garlic, and sausage. Lipps closes his restaurant after crab season, "around the end of October, when the temperature in the lake reaches 59 degrees and the crabs stop running, but we reopen for crawfish season next February or March, depending on when the season starts," he explains. Louisiana may produce between forty and fifty million pounds of hard crabs and about 100,000 pounds of soft crabs each year, but here is a little tip: don’t wait until the season ends to try the ultra-fresh barbecue crabs produced at the Crab Trap. Here you can write a comment to the post "Crab Cravings: making a mess with fresh seafood"